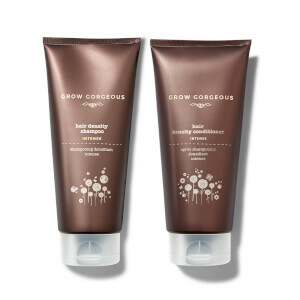 Combat thinning hair with the Grow Gorgeous Intensely Gorgeous Deluxe Bundle, a group of four products which support strands from root to tip, replenishing nutrients and hydration to create fuller, healthier-looking results. An ultra-concentrated formula infused with Amino Acids, Biotin, Caffeine and B-Vitamins to visibly increase density of hair, whilst advanced technology supports the follicles to promote healthy-looking locks. Delivering gentle, yet effective cleansing to prevent damage to hair, the shampoo is ideal for slow-growing and thinning hair, or for weak fibres in need of strengthening and repair. Suitable for all hair types, including colour-treated, you can expect denser, fuller-looking locks. Free from parabens and sulphates. An advanced scalp conditioning formula that aids healthy hair to leave fine, thinning tresses looking fuller and thicker. Combining an innovative form of Hyaluronic Acid with Amino Acids, Biotin and B-Vitamins, the conditioner addresses hair thinning and stimulates hair follicles to promote fuller-looking strands. Working to improve hair density and softness, the conditioner will leave locks looking fuller and healthier. Suitable for natural and colour-treated hair. Free from parabens and sulphates. Visibly increase hair thickness and softly nourish your scalp with the Grow Gorgeous Thickening Hair & Scalp Mask Intense. The unique multi-mask is enriched with Amino Acids and Caffeine to thicken thin locks, feeding your strands with Biotin and Pea Peptides to ensure hair is healthy, thick and full looking. Designed to deeply hydrate without weighing hair down, Coconut Oil and Hyaluronic Acid intensely moisturise the scalp, keeping it in optimum condition to achieve ultimate hair health. A unique, innovative treatment developed with a 40% concentration of seven advanced complexes and scientific technologies that stimulate the hair and scalp for vibrant hair that is protected from external damage. Lightweight and non-greasy, the sophisticated serum effectively balances Glycine and Zinc to improve hair length for a fuller appearance, whilst a unique form of water-compatible Caffeine absorbs into the scalp to reduce hair loss in a small time period. Shampoo: Aqua (Water), Sodium Lauroyl Methyl Isethionate, Niacinamide, Polyacrylate Crosspolymer-6¸ Parfum (Fragrance), PPG-26-Buteth-26, Ethoxydiglycol, Cocamidopropyl Betaine, PEG-40 Hydrogenated Castor Oil, Sodium Methyl Oleoyl Taurate, Sodium Cocoyl Isethionate, Cetyl Betaine, Caffeine, Inositol, Arginine, Biotin, Acetyl Cysteine, Acetyl Methionine, Oxidized Glutathione, Panthenyl Ethyl Ether, Glycine, Alanine, Serine, Valine, Proline, Threonine, Isoleucine, Phenylalanine, Aspartic Acid¸ Histidine, Sodium PCA, PCA, Saccharomyces (and) Zinc Ferment, Milk Protein (Lactis Proteinum)¸ Sodium Lactate, Urea, Sodium Citrate, Lactose, Citric Acid, di-Sodium Hydrogen Phosphate, Maltodextrin, Trisodium Ethylenediamine Disuccinate, Hydroxyethylcellulose, Xanthan gum, Alcohol Denatured, Diethyl Phthalate, Lauryl Betaine, Sodium Chloride, Sodium Benzoate, Phenoxyethanol, Chlorphenesin, Cinnamyl Alcohol, Alpha-Isomethyl Ionone, Linalool, Limonene, Butylphenyl Methylpropional, Hydroxyisohexyl 3-Cyclohexene Carboxaldehyde.